I hereby propose to all Asgardians the opportunity to choose whether we should or should not implement Universal Basic Income. For the those who do not know what it is, basically Universal Basic Income (UBI for short) is a form of social security in which all citizens or residents of a country receive a regular, unconditional sum of money - guaranteed, either from a government or some other public institution, independent of any other income. Basic income is often argued for by its advocates because of its potential to reduce poverty, or even eradicate poverty. The ability of basic income to eliminate poverty is uncontroversial because it is true by definition that an unconditional income set above the poverty line will eliminate poverty. Basic income, it is argued, is a much simpler and more transparent welfare system. Basic income and growth (or BIG) allows for potential economic growth: people may decide to invest in themselves to earn higher degrees and get interesting and well-paid jobs that, in turn, could trigger growth - This would be beneficial for Asgardia, if we truly want to live in a technocratic society. 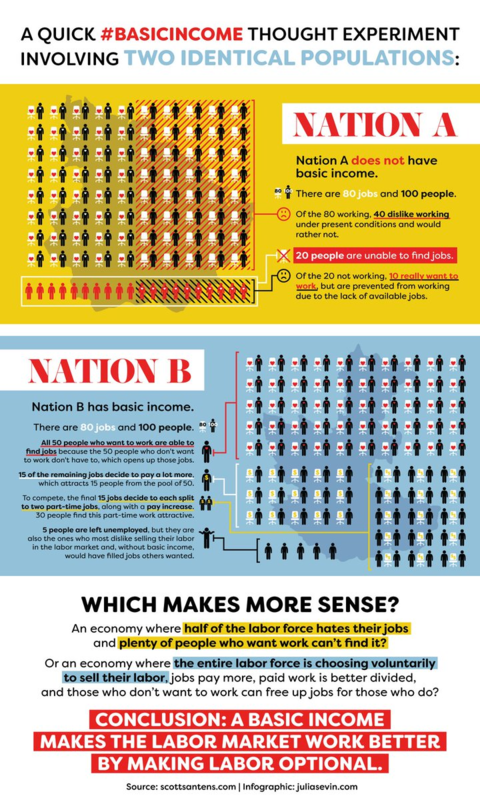 Supporters commonly make three very different arguments that basic income promotes freedom. First , although most basic income supporters tend to be politically left, right-leaning supporters, at least since the 1970s, have argued that policies like basic income free welfare recipients from the paternalistic oversight of conditional welfare-state policies. Second , Philippe Van Parijs has argued that basic income at the highest sustainable level is needed to support real freedom, or the freedom to do whatever one "might want to do." By this,Van Parijs means that all people should be free to use the resources of the Earth and the "external assets" people make out of them to do whatever they might want to do. Money is like an access ticket to use those resources, and so to make people equally free to do what they might want to do with the external assets of the world, the government should give each individual as many such access tickets as possible—that is, the highest sustainable basic income. Therefore, it should be believed that Pros outweigh the Cons in this proposal. Please like, share and debate below. Sign this petition to make this a reality. Ключевые слова: все авторы согласились на публикацию этой встрече и отказался от каких-либо прибыли от реализации этой книги. Это может показаться странным - предпринимателям интересоваться политикой распределения доходов. Но растет число громких заявлений из Силиконовой долины - руководители не возражают против всеобщего базового дохода (УБИ), система, в которой каждый получает стандартную сумму денег просто за то, что жив. Universal Income is meant by some to enslave us, instead of liberating us. We should do what Corey proposes, and move to a barter based system, instead of Marxism. Какое отношение всё это имеет к Асгардии? I've signed this petition, but would have added that Asgardia should seek to build up the UBI in line with the growth of our national economy, but not at the expense our mission to build up Earth's protective infrastructure. I believe that if someone needs to begin on a UBI, it would be also important that they contribute, somehow, of their gifts or time, to the cause. I would hate to see someone such as myself left behind only because I am without extra funds to start, it would need to be in alignment with a set amount of work to be given back to the nation, and to not have these folks branded, or made to standout in anyway. I agree this argue. However, we should think also how other people such as those without a hand or a leg or in a chair could contribute. As example, not many have same chances as Stephen Hawking had. And if you dont support the petition? @EddieB if you don't agree then don't sign it. Right now it's just a petition, it won't actually go into effect. It's just a way to get the idea out there. First Asgardia must become a real Nation, with taxes and money to spend. This seems like a great way to get lazy people to sign up to become Asgardians! To start a nation we need people willing to work hard and make sacrifices. Once the nation is established increasing the living standard of citizens would be wonderful goal. Since no Asgardians currently pay taxes, it seems to be a bit early to decide how to spend the money! OllyG , agreed. Though I agree the UBI should exist for citizens it also must not come as an incentive to becoming a Citizen. UBI doesn't take priority over other financial priorities for Asgardia. But if and when Asgardia is prosperous enough, we should implement an UBI that will help all citizens of Asgardia cover some of their basics needs to live on Earth or other Asgardia territory. Taxes are the one mistake all governments make. It forces inequality, and undue obligation. A government can easily be self-supporting, while at the same time be minimal and efficient. Basic income need not come at the expense of others. It can be created from the abundance of the universe, until a day when our personal time, our most valuable resource, becomes our currency. Taxes make the government your master, and not your servant. I strongly disagree with this concept. For a government to pay everyone a UBI first its citizens have to pay the government higher taxes to receive the money back from them! Combine this with the inevitable rise in prices when businesses know all citizens have extra money plus the higher taxes to have it in place to begin with and you get an endless cycle of higher taxes, higher prices and the need for the UBI to be constantly increased resulting again in higher taxes and so on and so on…. It is a very nice theory to have people paid for doing nothing, but doesn’t work when real people get involved, as there will always be people who take advantage. Surely a better idea is just to have lower taxes & less government handouts to encourage more people to work? Replace income with services and it makes much more sense as long as you keep it basic. No one should be allowed to die of hunger, dehydration, exposition to the elements ... add medial services and free education and you have give everyone the same chance for a good start. The idea is good, but without a strong and stable economy is unrealizable. Therefore, it is premature. I support this petition. Tax collection is not the only way to finance Universal Basic Income. One way I believe UBI can be started is through Helicopter Money (https://en.wikipedia.org/wiki/Helicopter_money) or quantitative easing for people (http://positivemoney.org/) , and with that, a functional economy would be created. Step 1 - Whenever a person becomes a citizen of Asgardia, 1000 SOLARS would be created out of nothing and this new money would be given to this new citizen. Step 2 - To encourage consumption, a law would be created something like this: a citizen could only save 40% of what he/she earned when he/she became a citizen. The other 60% the citizen would have to spend as he/she liked within a year within 10 different products or services, otherwise, the government would take what exceeded 40% and was not spent. Step 3 - Because of the law created in Step 2, other citizens who believe in Asgardia and want more SOLARS money would be encouraged to create business. These businesses would initially be digital products or services (ebooks, online courses, translations, programming etc.) and then tangible things (clothes with the symbol of Asgardia, toys and even food). To encourage entrepreneurship, these businesses would have no taxes. With these 3 steps, I believe a functional economy would be created in a short span of time. Is still necessary to discuss how to avoid fraud (someone could try to become a citizen several times), but I believe that with a little research this can be solved. Web of trust (https://en.wikipedia.org/wiki/Web_of_trust) is an example. Quantitive easing is currently being used in the U.S. and is proving to be a problem as far as devaluation of the U.S. Dollar. I.E., it takes more U.S. Dollars to make ONE Euro. So it would REALLY be more beneficial for me to live in Europe and send my money to the U.S.
Another thing that is quite disturbing is the fact that your method requires a removal of free economy... For Asgardia to be truly free, so must it's economy. by only allowing an Asgardian 40% savings and a time limit to spend the other 60%, that's not a free market...Especially when you put a timeline on it. So what happens to the money if they don't spent it in that timeline? Does the Asgardian government just "indian give" this money? Just the 60%? All of it? Tax it? these are questions I have. How will the SOLAR be backed? Every unit of currency has a guarantee of value for a physical...a tangible asset. Who will be funding the government. I am 100% sure very few, if NO ONE is going to be privy to the idea of having to report their REAL world income to the Asgardian government to be taxed based on each individual country's currency to fund Asgardia. I know with the amount of money i make and the U.S. government takes from me, my budget wouldn't allow for another coming in and taxing me. I don’t agree with the model that Quantitative easing(QE) is being used today. QE for people is another thing totally different. This video is how I understanding QE for people . This method of compulsory spending is about the money that someone receives when becoming a citizen of Asgardia. This compulsory spending would not be applied to the money of creating a business or working. An example: I receive 1000 SOLARs when I became a citizen, then, let's suppose, I decide to sell some online courses of programming and receive more 1000 SOLAR of this endeavor. In this scenario I don’t have to spend 60% of 2000 SOLARS that are in my account, I just need to spend 60% of 1000 SOLARS that I receive when I become a citizen. This question of how SOLAR will be backed certainly is not a trivial one. This question is related to the discussion of fiat money and representative money . But we can try a new approach to this making SOLAR backed with the number of citizen of Asgardia. This is just an idea to be considered, like in project ubu . Making SOLAR backed by the number of citizens we will be attributing an economic value to people. About taxes, I totally agree with you. Is nonsense to report real world income to the Asgardian government. If this happens, I will be one of the first to request revocation of my Asgardian citizenship. This is why I believe that UBI could and must be implemented without taxes. Taxes should only be implemented when existing a functional economy on Asgardia. And I believe that UBI can help create a functional economy. scattered in all the countries, I do not think it will succeed. "May make people lazy?" So far the ongoing study of UBI in Finland suggests that UBI increases happiness and incentive to work. It is worth adding that to your information. I think the concept is good, but as stated before, is premature. However, perhaps look at it more as providing people the ability to study and follow more productive lines of work to grow the community, rather than working in a call centre. Working in fast food. I understand that those jobs have a place in the current system, but look at removing damaging roles, and promote ones which will help us build our dream. Rather than a UBI - a re-look at the importance and value of money. Perhaps learn to share, and support eachother, give us less dependancy on the system that is already here, giving us more freedoms. There's a lot to work out, but I'd like to see this happen. Yes vote here. Money isn't the root of all evil, this is a common biblical misquote. It is 'The LOVE of money which is the root of all evil', there is a big difference. However, just as I agree we don't really need money if we work together, I would point out that money is already an illusory component of our lives. We work to earn money, to put a roof over our heads, and food and drink in our bellies, but that work has to be supported with this and that type of tool, clothing, fuel, gadgets etc., Surely it was much simpler for our ancestors who only had to sharpen a stick, listen to his ancestors advice, then track and catch, or build directly. They didn't need a bank or government for that matter to tell them they could or couldn't. These days we are enslaved by our lives, yet if modern tools and society disappeared overnight, most 'civilized' humans would not survive, period. Therefore it seems to me that we could have UBI, but as all our relationships are based on reciprocity (we all expect something when we give, even if it is a smile), in order for a cashless, or UBI type of life to work, we would have to work hard at filling each others expectations (we already do this though as part of our getting on with each other in society) sothat no-one felt or was actually cheated. So for instance for a share in the food you collected/bought, you might say to me that you want a pair of the slippers or shears (whatever) I am making, or have. Or because I helped bring in the harvest, and helped clean and cook, we all eat for free. We put value on our time, but ignore the fact that we inherited the Sun, and this planet for free, and that the food and the water, the wind, and the waves, the fire and the ice was available to those who would do the work to get it. How ever did our ancestors survive without high finance and governmental oversight? Yes things have changed, but arguably UBI isn't an argument about affordabilty, but one of ethics and logic. UBI could be good but Income/Money has the potential to be easily misused and abused. Why not go for UBS ? Universal Basic Services : Where everyone gets free access to the basic need air, food, water, clothing and shelter, sanitation, education, and healthcare. I am also of the opinion that our government official should be provided with these and all else that is required for the job free of charge but be allowed no other salary, commissions or "perks" from any external source to avoid recreating the current lobbyist nightmare most supposedly democratic country are now entangle d in. You mirror my thoughts on this as well. I am not opposed to UBI but believe our purpose should not be fiscally driven. Our society is one of innovation and exploration. It is one built by both artists and engineers. The most basic of services necessary for life must be provided and be the focus of our core work as a society. The production of air, water, food and the provision of energy, health, housing, sanitation and transportation as core universal services. Even basic equipment and clothing required to survive in the environments in which we will live and work should be provided at a core level. Work incentive is survival in the most basic terms. I believe the Supreme Values speak to this as we are all called to contribute to Asgardian society through work. That work is geared toward our gifts and talents but also should be underpinned by the needs of the greater good. We at some point in time expect to do whatever is required of us in the name of our fellow citizens and for their welfare. This is a basic Biblical and moral principle, do for others as you hope they will do for you. This directly speaks to the greater good and mission set out in the Constitution and our Supreme Values. Core services and necessities will be our starting point. Monetary generation should be a concern of the government and private business through innovation of products and tourism. Doing so allows for freedom of our market system over and above the basic provision of the needs of daily living. In this light, UBI could be a way of reinvesting in the people to spur creativity and innovation in ways that generate income from external sources through information and technology exports to further grow Asgardian society and settlements. It should not be required to survive at a basic level economically. The bulk of work performed in our society should be geared to the survival of society as well as the continued positive growth and development of our communities. This activity requires work. This work requires workers. As we work for the common good, we work for our own survival in the most hostile of environments. If the generation of income as wealth be our motivation, I submit we are doomed to repeat the mistakes of the earthly past. If the creation of value in products and services for the common good are our motivation, we shift our focus from that of "self" to that of "others". In doing this, we are truly loving ourselves and giving of ourselves. This is a basic moral principle and (I believe) core to our values as Asgardians. I don't believe in the UBI, i believe every person should work for what ever he or she gets. Asgardia should be of hard Working people and not to be populated by lazys. Is Labor not currently optional? I thought slavery was eradicated by the 13th amendment. Someone best holla at my boy Gorsuch. I believe that the necessary income of society comes from the hard work of the people and creates more wealth for Asgardia, so I believe that we should first solve the problem of employment and develop a new batch of future jobs. We have to think about it before we get there. How do you like it? I don't see ANY pro's of this. First and foremost, this petition lacks ANY kind of ACTUAL evidence in any claim contained within. Without some kind of actual independant and neutral entity conducting a study on said subject matter, I must kindly decline to vote on this. 1) There is NO proof that UBI (Welfare) actually protects anyone's right to say no. 2) UBI gives the government control over it's citizens. I for one, don't want anymore bureaucracy in my nor my family's life (for ALL generations) than there already is. 3) There is NO proof in ANY positive decrease in unemployment numbers. My question to you is: When is the last time you ran by a study that showed a decrease in unemployment numbers when provided with a source of income. 4) Being in line with #2, there is no actual evidence that UBI decreases poverty. It may help JUST A LITTLE, but you cannot kill poverty by giving them an incentive to not work. 5) There are more cons, but not enough time nor space to go through all of them. Now, what I COULD foresee, is a work incentive. EVERYONE in Asgardia should work, unless they have built wealth through a business. Therefore, you should make a work incentive in SOLAR, which is more attractive than it's welfare counterpart. When implemented correctly, working is more attractive. This incentive could be in the form of tax cuts, physical assets such as gold, silver, etc. ; a pre-determined amount of SOLAR based off how good your job is...Give people a reason to work and to further their education. I agree with you when you say that UBI lacks evidence in any claim contained. But that is because UBI was never implemented in large scale. The experiment with UBI in Canada , Finland and Netherlands are running to show what are the real pros and cons of this system. I believe that Asgardia could start an experiment with UBI too. UBI is a worthwhile idea and would cost nothing from anyone to start this experiment in Asgardia perspective. A simple announcement like this could start this experiment: “Hey citizens of Asgardia, here is some SOLARs money to you, start buying/selling with that”. People that believe in Asgardia and believe that someday will be possible to buy tickets to space with SOLARs will start buying/selling/accumulating in SOLARs. Again, this is just an idea that can work or not. But worthwhile test this idea because this can create a functional economy in Asgardia. Some cities in Canada and the United States have started to implement this kind of income. They find that people are more likely to spend intelligently, and do things that will make them more wealthy than they were before. There is a a Ted talk on poverty and a video on a allowed income on Facebook. It's worth looking into. Asgardia is the society of the future not of the past and that means, the majority of Asgardia income will come from automated and robotized assets. Collecting space debris appears to be a priority for Asgardia and this can't be done manually like asteroids mining, planetaries shield, and any future space transports or another source of income from space are mostly to be done by robots or other automated systems. Due to the nature of Asgardia, the ratio of employment will probably be as is maximum around 1 or 2 %. Who's among us will work and receive income from the lunch and creation of our first satellite this autumn? This is Asgardia now and the future will be also like this if we do not apply the U.B.I. As we Asgardians, having agreed by our vote to provide equal access to space to all indistinctly of their country of origin, race, religion or nonreligion and especially on this concern indistinctly of their wealth situation. Yes, the U.B.I. must be implemented if we do not want to create a nation of excluded citizens. I feel as if UBI will ultimately make it more difficult for people who rely on it as a source of income to get anything done and proceed to create drag on other people in the nation who are working for their income. If everyone has $20, then $20 is worthless. UBI should be granted at least partially on merit as to ensure the individuals receiving the money are not sitting idly by. Some despicable people who exist on welfare in the United States are perfectly capable of committing to the workforce but bear no plans on doing so or providing directly to society because their income is given to them for nothing. I believe that the UBI could be interpreted as a populist measure ... Perhaps and perhaps inspired by the fatal experience of my country Venezuela, where the Paternalistic State has put an infinite number of "aids" equivalent to a monthly minimum wage, being increased almost excessively Frequent by the President ... what has been the nefarious result? With a policy that restricts the production of goods and services exportable and of benefit to the country, entrepreneurs will go bankrupt, unemployment increases. BUT, people, far from looking for ways to continue working, they simply dedicate themselves to not working and Waiting for Daddy State to pass the aid; And even coding it for political ends. That is why I am very suspicious of the UBI. Rather, it is better to propose free access to basic services, to saving and to promote the greater collective income to Asgardia, rewarding those who work harder and aupando the diversification of work. Claro has access to real and justified unemployment and retirement funds, as incentives to the worker of Asgardia. Considero que el UBI pudiera interpretarse como una medida populista... Quizas y tal vez inspirado por la fatal experiencia de mi país Venezuela, donde el Estado Paternalista ha puesto infinidad de "ayudas" equiparables a un salario mínimo mensual, siendo aumentado casi que excesivamente frecuente por el Presidente... ¿cual ha sido el nefasto resultado? Con una política que restringe la producción de bienes y servicios exportables y de beneficio al país, los empresarios se van a quiebra, se incrementa el desempleo PERO, la gente, lejos de buscar la forma de seguir trabajando, simplemente se dedican a no trabajar y esperar que Daddy State pase la ayuda; e incluso codicionandola a fines políticos. Por eso veo con mucho recelo el UBI. MAs bien es mejor proponer el libre acceso a los servicios básicos, al ahorro y promover el mayor ingreso colectivo a Asgardia, premiando a quien mas trabaja y aupando la diversificación del trabajo. Claro esta con acceso a fondos de cesantía y retiro reales y justificados, como incentivos al trabajador de Asgardia. The bottom line is, I would like to remind you of a famous quote by J.F.Kennedy ,if am not wrong. It goes roughly like this Do what you can do for the country, not ask what the country can do for you. Please somebody correct it. Im a bit worrying about lazy generation that may appear caused by UBI. However, as I realize that Asgardian must have the accessibility of "food, clothing, shelter, and basic material and immaterial benefits", UBI becomes to be a very good way to make sure that all Asgardians get what supposed to be their right as an Asgardian. I support! Here in Brazil, we had a Senator who also defended this thesis of Basic Income of Citizenship, Mr. Eduardo Matarazzo Suplicy (who unfortunately could not re-elect, even because the Party in which he was part, became involved in corruption), but taking this Christopher J Boardman, it is very fair and feasible to create this income. Asgardians are distributed into many current nations. We have no Asgardian local economy. Rather, Asgardians pay for goods and services in their host nation. Almost every resource/currency an Asgardian has is hosted and spent in the local economies of the host nation. Asgardian citizens will very quickly leak/leach any UBI funds into said host nation; very few UBI funds will ever make it back into Asgardia to help the next group of Asgardians receive a payment. In fact, the promise of a UBI to attracts new tax-paying Citizens (as I've seen suggested) may be a form of Ponzi Scheme. Another issue: UBI's are intended to help people in poverty, yet you could not use an Asgardian UBI to buy food, clothes, or shelter. There is no Asgardian supermarket or grocery store in your nation. There are no Asgardian home builders. And if you do find someone who accepts the Asgardian UBI (in the form of SOLAR), you have no guarantee of the exchange rate. Different necessities have different currency values across the world. If you have 1 US dollar, it will buy you more food in China and less food in England. The UBI would not be of a universal value as the purchasing power will be different nation to nation, requiring frequent adjustment for payments to citizens in every country in the world. In some nations a UBI probably makes sense within that nation's borders. Asgardia has no physical border and no local economy (yet), an Asgardian UBI ultimately pushes resources out of Asgardia, weakening it. Depending on the pace of Asgardia's growth and value to the world, there may not be the feasibility for an Asgardian UBI for this, or many more, generations. I made some considerations about the destination of UBI's money in the midst of these comments. I proposed a trick to stimulate the economy among the citizens of Asgardia. Briefly speaking, a compulsory expenditure of income earned through the UBI would be established. An example: if a person earned 200 SOLARs through UBI, that person would have to spend 100 SOLARs on something. I believe this would stimulate the creation of a functional economy because many people actually believe in Asgardia and would be willing to open a business that would accept SOLAR. In the beginning, it would be digital products like online courses and digital books and then tangible products. Another example: Here in Brazil some citizens of Asgardia created a site to promote Asgardia and to divulge information. If I had SOLAR I would give some to them as a form of recognition for the work they are doing. I think this would be the beginning of a local economy in Asgardia so that in the future people would accept SOLAR for food and clothing. About the other problem. You're right, UBI intends to help people in poverty. That's why I believe that Citizen's Income (CI) is a more accurate term to indicate how a SOLAR cryptocurrency distribution policy can help create a functional economy in Asgardia. The difference between UBI and CI is that UBI intends to provide the basics, on the other hand, CI can vary according to citizen participation in society. An example: someone who votes in the elections of Asgardia would receive more than those who do not vote. I'm working on a simulation of how this could work. When it's ready, I'll post it here. приветствую Кардосо, если ты этим занимаешься как можно тебе помочь? Плюсы: - социально-экономические разногласия между богатыми и бедными исчезнет, так как состоятельные люди будут вносить существенный вклад в развитие страны и поддержку для менее состоятельных граждан. В то же время, поскольку под имеет ограниченный Размер, менее состоятельных граждан будет стремиться к повышению их производительности труда и улучшению состояния экономики в целом; - острая борьба за деньги исчезнут, потому что человек достоин существования уже будет гарантировано, что окажет положительное влияние на межличностные отношения между гражданами; - нет никакой дискриминации - под выкладывается для всех. There is no need to use it on big scale from the start, but not doing it at all is worse. We are no longer in era where we are incapable of implementing this. Also direct money support is not the only way, it could be done roundabout way by exactly dividing expenses for paying for/ giving free accommodation, food, education, entertainment, sport, clothes, work/hobby expenses.... That way money wouldn't be wasted in any way. As someone here said we all come from different backgrounds and such, the key to a successful future of all Asgardians, is to put aside all the things of this world, and create a new world. I think we should think of Asgardia as a (family) business, all of us working together to achieve a goal, once we are in space everyone puts their wealth, no matter how little or how big it is, into the Bank of Asgardia. This would be considered our collateral or assets. Have everything on the space ark's as free access, you use as needed. Since everyone is working together for the common good of Asgardia, no payment for work services would be needed, your payment in essence would be all the other services like food, clothing, entertainment, housing and so on. We work towards a way to lose our dependence to earth and gather our resources from our own independent ways. We use our collateral, or assets, to invest in lucrative investments throughout the world on earth, to finance all our needs until we are able to become independent. We elect representatives to control the finances and investments (who are the most qualified by their field of expertise) We vote on approval of new materials and projects to be funded with our assets as they arise using the established processes and always keep our objectives as Asgardians as our number one priority. Consider the fact that our nation doesn't have enough wealth to support this right now, but later down the road when we make it to space, get our resources from space, and recognized by the UN as a actual nation. I don't see why this couldn't be plausible, besides the fact that its communism and history has kind of proven that communism fails. Olabilir. Ama bu insanları kolay paraya alıştırmamalı. I would like to see this as something which starts small but grows over time. It could be initially funded with donations, and I would certainly be willing to donate for that purpose. The problem with universal services is the logistics, cash can work anywhere. Excelente iniciativa que ya se está aplicando en algunos países como Canada y Holanda. Yo la veo como una iniciativa de transición a la Economía Basada en Recursos que promueve Jacque Fresco en la que "se deja de utilizar el dinero, y se declaran los recursos como patrimonio de la humanidad a los que todos tenemos derecho por igual, y mediante la tecnología se garantiza el acceso a todos los seres humanos a cubrir todas sus necesidades". If not UBI, we should have the basic needs provided, ie; power, water, gas, internet, dwellings and food. Everything else you pay for. I think that's a great petition but only applicable when Asgardia have its first territory whether a donation from the ONU, a donation from another country a space station or a colony in another planet or satélite. It can cause real problems with the original countries who am be a threat in Asgardia intentions. I also agree that UBI needs to be first for those who are incapable of doing any job and then to the people who already made any kind of service for the kingdom and at the end only if doesn't affect the economy of our nation start with the older people to the younger. As I said pretty premature but very interesting petition, I'll suported as soon as when have our first colony in space. Asgardians are leading - in motivation, in ideas, in future space projects and much more - Asgardians think different, we are all highly motivated and have one purpose! So a UBI for all Asgardians will NOT cause lazybones - it will free us from financial constraints and give everyone of us the opportunity to devote more time to Asgardia. A UBI for Asgardians will be very different from a UBI for all people on earth! Отличная идея - идея будущего. Это снизит преступность, создаст благоприятную атмосферу, освободит мозги человека для творческого поиска применения своих сил. Только в России это не реально при нашем режиме. Государство на это НИКОГДА не пойдет. НИКОГДА. Perhaps it is wise to expand our thinking and try move away from the old linear thinking patterns as humanity has been groomed into being on Earth. What do you say to it? How about YES I agree with the automatic income/allowance. Every person will decide how their life will be influences in a highly Inspired new way of Beingness. Live longer, more free, learn about higher dimensional healing methods such as Crystal and frequency based tone usage. Scholarship programs should be free. Work should not have to be a have to slave your day away like we are used too. Money could rather be spent on travel, art, communication improvement methods and manufacturing - what people want and need and then barter or trade in cargo with other civilizations within the multiverse or even just our solar galaxy for beginners? In fact i'm agree with the idea of equality and liberty that UBI would provide but i think that Everyone who want to become asgardian has to participate to the evolution of the nation, of course everyone can not participate at the same level and an UBI maybe can favorise the participation of people who can not without it, but it's necessary to proved your implication to asgardia for received the UBI. We have to make sur that wrong people who don't participate of the general effort for a better futur for humanity don't beneficiate of it. People have to proove implication at them level . Согласен. Другими словами, этот базовый доход или выгода. Зачем? Проще говоря: заставить людей работать продуктивно, чтобы переход к новой эре произошел качественно и как можно быстрее. Для общества стало гуманным, и что основными инвестициями Асгардии были инвестиции в человеческие ресурсы: в первую очередь в здоровье человека. Потому что только здоровый человек даст здоровое потомство и здоровую нацию в целом. Естественно, все эти меры принесут пользу целым людям Асгардии. I agree. This basic income or benefit, in other words, should be. Why? In simple terms: To make people work productively, so that the transition to a new era has occurred qualitatively, and as quickly as possible. To the society grew humane, and that the main investment of Asgardia, was the investment in human resources: in human health in the first place. Because only a healthy person will give a healthy offspring and a healthy nation as a whole. Naturally, all these measures will benefit the whole people of Asgardia. I support the idea of BIG. Its a fair way of compensation toward those, whom are can't find a fairly paying workplace. For the long years of delay that is equals with the long suffering, which is degrades the human mind and all significant abilities. Taking high risk of inhumane transformation that are influencing all positive intentions with sufficating ways of ignorance. Thats why the people whom are understand and even turn against this idea. Them are need to experience a journey, where they meet with they mirror of that decision. Will it gives to them advice to acknowledge any changes that are support human and all sentient lifes well-being. I am had enough with all the persons around me, who turn simply erruptive, when somebody wants to change a unhealthy thing and nol longer to stay in state of decay and unsuitable ways of any means. A nations value is to some degree dependent upon its currency. Currencies value, likewise, is dependent upon the work or material that it can provide. Therefore, before we can hope to achieve UBI for Asgardians, we must provide a material or service which is valuable to the international community. What can Asgardia offer that other countries will want, or need? As of the moment, we are self-driven, and self-contained. Perhaps as we expand, even as early as with Asgardia-2, we could offer a grid computing node, or relay service, to other countries in space. This would naturally have to be fully in line with current communications standards, for both equitable and secure communications. This is one way that we could provide a stable exchange rate for the Solar. That would necessitate another petition, to provide a means for this all to come about. Yes, this is an interesting concept. As it stands, the concept is idiotic for Earth bound societies to adopt (except maybe the ultra wealthy ones like Norway? ), but perhaps it is a perfect solution for Asgardia? Since this is basically a virtual society (for now? ), the only thing that makes sense is a uniformly distributed (at first - that changes as you 'spend' it. Duh.) exchange unit that is in the form of a custom cryptocurrency. Actually, I'm quite baffled that the 'coin' hasn't already been launched. An ICO could result in creating the currency with the added benefit of the currency actually being worth something outside of the Asgardian boarders (Does Asgardia have boarders?). OK, sorry, I'm getting off topic. I'll have more to add later on other threads as I look around and get comfortable with my surroundings. I support UBI in principle but believe our purpose should not be fiscally driven. Our society is one of innovation and exploration. It is one built by both artists and engineers. The most basic of services necessary for life must be provided and be the focus of our core work as a society. The production of air, water, food and the provision of energy, health, housing, sanitation and transportation as core universal services. Even basic equipment and clothing required to survive in the environments in which we will live and work should be provided at a core level. In this light, UBI could be a way of reinvesting in the people to spur creativity and innovation in ways that generate income from external sources through information and technology exports to further grow Asgardian society and settlements. UBI could be provided on an annual or semi-annual basis and based upon available funds in the government. It should not be, at any time, a required stipend to survive at a basic level economically. Granted, generation of cryptocurrency (SOLARS) is a vital work to be performed and can be done so through education and training programs that pull in gifted and talented people from all walks of life. But the generation of cryptocurrency for the purpose of funding and securing vital raw resources and equipment is merely a stepping stone for our society. It should never become the end of our works but only a means. I propose the implementation of virtu dollar for the solar monetary system that you cam pay yourself more if you run out and feed it into the economy. More on the model is in my blog on it. As far as worrying about a UBI encouraging 'lazy' people; Who are we to be in charge of who is lazy, and who is not. Is a person being lazy, or just relaxing? Is lazy a crime, and what punishment should be given? Do we exile them to a prison cell, or a tropical beach for the crime of laziness? It is no one's business if another is 'lazy'. That is imposing your will on others. Perhaps they are simply waiting for that creative spark, or only lack the funds to create a masterpiece. I support UBI as a means to an end, which is to work towards a technologically advanced, post-scarcity, space civilization, basically achieving the various stages in the Kardashev Scale of civilizations . It's hard for many of us to imagine how these type of civilizations would inspire citizens to contribute to the common good when we are all stuck in the current Type 0 civilization, where we have to use money to obtain things to meet our physiological needs. I also think that the laziness factor is overblown. Inspiration or boredom, will compel the overwhelming majority to work towards the advancement of the Asgardian civilization. It seems that we agree on UBI, but not on how we get there or how it would be implemented. In my candidate profile I have out lined how we could reach this high goal. Here I would just like to give a short summary on one way it is possible. All products and services provided by Asgardia would be marketed using a simple formula. My idea is that 40% be the cost of production with the remaining 60% being set aside for the UBI, research, and maintaining our infrastructure. This will allow Asgardia to remain Independent of any outside money while allowing for growth and prosperity. For more details please see the long version of this on my page. Tout à fait d'accord, il y a beaucoup d'espoir pour l'humanité et ce sont des initiatives comme celles-ci qui nous sauveront de nous-même. Le revenu universel doit être implanté au plus tôt car l'éducation est dépassée et les hordes d'humains inemployables car obsolètes par rapport à un robot rendront bientôt cette société invivable. Par contre, il ne faut pas tout miser dessus et faire en sorte que l'éducation suive car sinon, nous allons nous retrouver avec une grande partie de la population totalement déconnectée de la connaissance avec quelques uns qui domineront tout. Bien former les populations à être complémentaires de l'I.A sera essentiel dans les années à venir. Le revenu universel individuel inconditionnel est une solution facile et efficace mais c'est une solution dangereuse à long terme. Anyone know the answer where the funds from for UBI? How we could make income in Asgardia? be employed or run self-employment? if no earning and not paying tax, how will be the government providing this money? UBI is only a working long-term solution when it is done 'share-holder style' - essentially, each citizen holds 1 share in the 'common stock' of the nation, with the total number of shares being equal to the total number of citizens. Hey im kinda new here, can anyone tell me how to actually vote yes? I was not surprised at all to see a demand for UBI without any suggestions as how to sustainably fund it, among many other problems the idea of UBI has. For anyone not aware, Income and intelligence go hand in hand. Some cities have already started looking into this program have seen that is working. I highly suggest watching the TED talk on poverty and how people spend money differently, and to look at the recent research on what the results of this program are. https://www.facebook.com/ATTNVideo/videos/549847588767963/ https://www.fastcompany.com/3055679/a-dutch-city-is-experimenting-with-giving-away-a-basic-income-of-1000-a-month I highly suggest reading more on the basic income. I am in favour of UBI as opposed to being forced to work for an income so that your basic needs are covered. BUT, I think as a forward thinking nation, which Asgardia certainly is, we need to start thinking about better solutions than even UBI. We need to start discussing how can people's basic needs be met without the need for money/income. How can we be fully self-sufficient citizens of Asgardia? Where any money/income that is made, is not necessary to cover basic needs like shelter/home, food, healthcare, etc. This might be a very foreign concept to most of you, due to years of conditioning by the dysfunctional and oppressive system here on Earth, but it definitely is a topic worthy of discussion, and serious consideration. interesting, however for hard works and other kind of works could be used specialized robots to help, but not A.I. obviously. So it could be a flexible economy system, where humans could contribute freely without being forced. Sounds an awful lot like communism..I vote no! everyone that states they should get a basic income whilst not working in space that cost xxxx$$$ to get you up there, and you want free money.. I support. For different kinds of works there could be used specialized robots, but not AI. And humans could contribute without hard efforts and even improving their intelligence. Obviously in Administration, Health, Law and Justice only humans work, not "robots". It depend how you organize the system. Хотелось бы добавить -БАЗУ для создания капитала для универсального базового дохода надо создавать на основе создания государственных предприятий .Частное предпренимательство надо запретить , оставив совместное с государством создание предприятия , где бы 51% акций данного предприятия пренадлежал государству , которое бы на этой основе и создавало БАНК для универсального базового дохода .